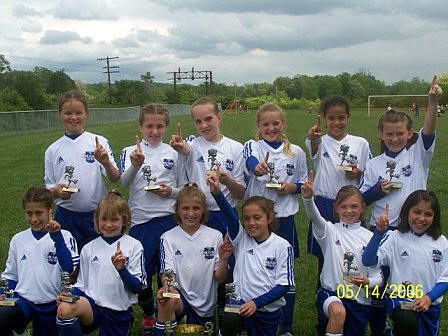 The adidas Thunder United FC95 GU10 Hericanes stormed into Northern KY and won the 2006 Northern Kentucky United Challenge Cup GU10 Red (Upper Division) May 13/14, 2006. SAT: Won the first match against St Francis Firecrackers from Indiana with a score of 6 to 0. Won the second match against NK United 95 RED with score of 2 to 1. SUN: Won the third match against NK United Huricanes with a score of 1 to 0. Final match was played against NK United 95 RED, adidas Thunder United won with a final score of 1 to 0. Leaving with a total 10 goals to opponents 1. adidas Thunder United Hericanes won with GREAT team play and were lead with outstanding play by Goal Keeper Courtney Barker by only giving up 1 goal in 4 games! The girls are coached by Tim and Carla Snyder. Franklin and Little Miami School Districts.